Today Malcolm Pett of http://greyhorsebot.com talks about the research he is doing into profitable trainers and jockeys. Over the last year or so I have got really interested in Jockey and Trainers. There is always a lot of talk about following the ones that are “in form”. One thing I have learned is that it is not easy following them but if you manage your money correctly and are prepared to follow through then they can be rewarding. One of the “open” tests we have been running at the Grey Horse Bot web site for the last 5 months is 16 jockeys to follow on the flat (grass only). For me this system shows quite clearly how “interesting” it can be to follow Jockeys. When you look at statistics from a system there are always one or two figures that can give you an understanding to how hard it can be to follow a system. 13.35% strike rate normally means some long losing runs. ROI 7.67 also points to a lot of work to earn those 277 points. Of course with a bit more work and study we could have probably cut out some of the races and maybe even some of the Jockey could have been dropped. But it does show that they can be very profitable even if they can be hard work to follow. With the jump season upon us it’s a good time to look at some other statistics. If we take Jockeys running on Handicap Hurdles with at least 100 runs (over the last two years). Even the best only manage an average strike rate of around 16 to 18%. You can find higher strike rates on jockeys with less runs so it is always worth looking for Jockeys that maybe only pick certain races to run in or new ones that appear to have started well. This figure alone should tell you that you need to see if any jockey you want to follow does better in certain types of races of with specific trainers. Trainers (less runs) do not fare much better on overall strike rate with the average being pretty similar to Jockeys. The really interesting statistic is Jockeys and Trainers. There is no doubt that there are pairings that are very successful like A P McCoy and Jim Best. Strike rate on many of these are as high as 50% (over the last 2 years) and many are in the 30 to 40% range. Some of these pairings can be very profitable especially some on the less well known ones. So if you don’t like the idea of following Jockeys or Trainers on their own because of the low strike rate then the answer could be Jockey and Trainer pairs. Check out open testing in the Article section of the Grey Horse Bot web site. Strike rate and Average winning odds. 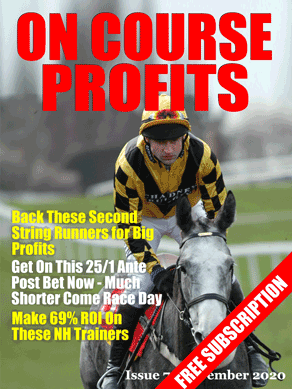 As strike rate goes up average winning odds can come down. You tend to end up with two choices. Low strike rate but high odds winners. This probably represents the real value end of the scale where you are picking runners that most people think have very little chance of winning. And normally at a very good price. The strike rate of these systems is generally between 10 and 20%. If you run a system like this then it’s probably better to use Betfair because the odds on outsiders can often be far better than you will find at the bookies. Look out for long losing runs because these normally spell disaster for the un-aware punter. Then we have the high strike rate but low odds end of the spectrum. Here you are likely to be on the first or second favourite and value is going to be a real issue. Strike rate should be in the high 30’s but even better if you can get to 40% or more. Keeping an eye on your average winning odds is going to be critical and you will probably have to watch the exchanges and the bookies or even use a BOG bookie to get the best prices. Your job here will probably be to match or beat SP as often as you can. The perfect scenario would be somewhere in between the two but it is unlikely you will find one system that will have a reasonable strike rate with value bets. Probably the best way to achieve this would be to use “Nano” systems. On their own these types of systems have very few selections but tend to have strike rates of 20% or more. Combining a number of them together means you have a better chance of getting a reasonable strike rate and achieving value. It does mean you have more systems to follow but the long term profit could be worth the effort. Over at the Grey Horse Bot website we test all these ideas. At the moment we have a couple of tests looking to achieve strike rates of 40% and 50%. As already discussed you will find the prices on the winners can be quite short but it can be surprising when you get the odd higher priced winner. We are also running long term tests on system that have a much lower strike rate. And you can see very clearly from the results that these types of systems have long losing runs and often only get into profit because of big priced winning selections. When you decide on what type of system(s) to follow you have to ask yourself can you take the losing runs or are you prepared to look for the best price. Otherwise a bunch of “Nano” systems may be the best thing for you. Thank you as always for reading I really appreciate it.